Found these beauties on the road while running. Aloha. It’s mango season in Hawaii and I’ve been collecting mangos galore. Our neighbor has kindly gifted me over a dozen mangos over the last two weeks from the mango tree in his yard, and I’ve collected mangos on the road during my morning runs. There is a huge mango tree that spills over the yard and drops its treasure onto the main road that I run, almost daily. A few days ago I hit the jackpot, finding 5 mangos. People were giving me the shaka as I ran passed them holding the mangos in each hand, pumping up Diamond Head Road. What to do with all these mangos? Eat freshly cut, make smoothies, add to oatmeal, cook with chicken, and of course make mango bread. Here is a simple mango bread recipe that we whipped up for your pleasure. Pre-heat oven at 350 degrees F. Prepare baking dish with parchment paper. In a large bowl, mash banana, and add milk, and maple syrup. Mix well. Add to wet ingredients, flours, flaxseed, baking powder, ground ginger, and salt. Mix until combined. Fold in mango chunks. Do not overmix. Bake in oven for 55 minutes at 350 degrees F.
Let cool and then either slice or cut into squares. If you don’t live in a tropical spot where mangos are readily available, bake this bread with frozen mango. The bread will be delicious with any kind! 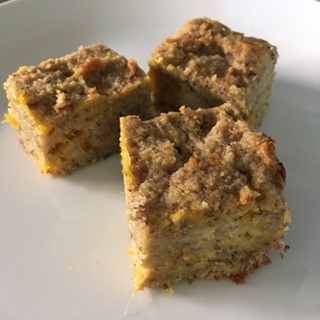 This entry was posted in Nutrition, Recipes, Weekly Blogs and tagged breads, delicious healthy food, Hawaii, healthy mango bread, mango, mango bread, summer fruit, sweet and delicious food. Bookmark the permalink. I would love to be running on that road. the mango treasures are an inspiration enough. Good Job. It is my favorite place to run. You must try it! The mangos are definitely a bonus. Thanks for visiting our site. We’ve been so busy that we have not had time to post. We appreciate your support. I know the busy feeling. I got up this morning and mango smoothie. I luv them.